Is Wood Chip Mulch an Effective Option? | Mr. Tree, Inc.
Have you ever noticed a layer of material on the surface of the soil around trees and wondered what it was there for? That layer is referred to as mulch and while it makes your landscaping aesthetically pleasing, it also plays an integral role in ensuring the healthy growth of plants and trees. Just like humans, even trees need care and the right environment to thrive. One of the most important aspects of tree care involves mulching. Many people put it off thinking its time-consuming and expensive, but trees that are properly mulched certainly grow stronger and healthier. Mulch is generally placed at a maximum depth of 3 to 4 inches and spread to a diameter of at least 3 feet, depending on the size of the tree. The best time to apply mulch is said to be between mid to late spring when the weather is warm. Never underestimate the power of mulching as making it a gardening practice will truly save you time and money on watering, weeding, and dealing with pest problems in the future. There are two types of mulch – organic and inorganic. Organic mulch is comprised of natural/living materials that eventually decompose such as wood chips, shredded leaves, straw, grass clippings, bark chips, sawdust, and pine needles. Inorganic mulch, on the other hand, doesn’t decompose and includes materials such as newspaper, gravel, rubber mulch, landscape fabric, and black plastic among others. Organic mulch is predominantly preferred as it is easily available and enriches the soil when it decomposes. Confused which kind of organic mulch to use? Well, it entirely depends on your purpose and budget. However, as per a 1990 study comparing 15 different organic mulches, wood chips were one of the best for holding moisture, moderating soil temperatures, controlling weeds, and overall sustainability. As the name suggests, wood chip mulch refers to mulch comprising of small to medium-sized pieces of wood. Trees need an adequate amount of water to grow which is mostly lost due to evaporation. However, when you apply mulch around the tree, it acts as a barrier between the sunlight and the tree’s roots, thereby slowing down evaporation and maintaining moisture levels in the soil. Wood chip mulch helps achieve that effectively as it absorbs more water than the other available mulches. It is also able to retain moisture with ease which helps in cooling down the soil and releasing it to the trees. This also means that you don’t need to water your trees as often. Weeds are a huge nuisance and once they make their way near your vegetation, there is no stopping them. They rob water and nutrients from your trees and affect their growth. If you want to get rid of this problem, turn to one of the most surefire weed-control methods – mulching. 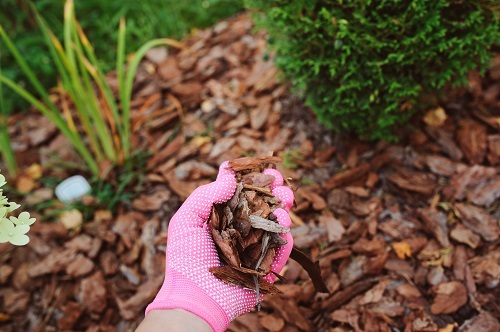 As wood chip mulch is comprised of a variety of materials, it is more efficient when it comes to depriving weeds off the light and warmth they need to survive. So, apply 2-3 inches of mulch and protect your trees from those pesky weeds. As an organic mulch, wood chips are bound to decompose over time. And as they break down, they add nutrients and organic matter into the soil, enhancing its fertility and leading to healthier plant growth. However, while some argue that wood chip mulch can rob the soil of nitrogen, studies have found that the yield of most crops had improved after the addition of wood chips, especially when they were placed on the top surface of the soil. Wood chips act as the perfect insulators and help to regulate the soil temperature. They protect the soil from extreme temperatures which would otherwise create an unsuitable environment for trees to grow. Yes, wood chip mulch does decompose with time but when compared to other organic mulches, they are more long-lasting. It is slow to decay and sticks around for five to seven years in the soil. It also makes for more attractive options when laid out and is an easy process that nearly anyone could tackle alone. Availability is an important factor when it comes to settling on the type of mulch you should use. The best part about wood chip mulch is that it is readily available. You can purchase it from a local arborist, garden, or even recycling center. It comes ready in the sizes perfect for mulching. You may also be able to obtain wood chips for free from companies such as tree care, paper, and electric companies. After tree removal, these companies are left with wood chips as residue which can then be put to good use. So, why go for any other alternatives when wood chip mulch is so easily available and economical? All these reasons further show that wood chip mulch is indeed a great option. However, do remember that it is an organic mulch and will tend to decompose and disappear after a while. You cannot just apply it once and forget about it. It is important to replenish wood chip mulch from time to time for it to be most effective. Mulching might sound easy but if not done properly can give rise to potential problems. For instance, many make the mistake of creating ‘mulch volcanoes’ or placing the mulch too close to the tree trunk. These common mistakes obstruct oxygen and don’t give the tree enough breathing space, thereby hindering growth. If you have any questions, reach out to Mr. Tree. With over 30 years of experience in residential and commercial tree care, we offer the highest quality tree care services ranging from planting trees to maintaining and removing them. So, contact us today and let us offer our expertise to keep your trees growing strong and healthy.